Essaouira is an enchanting town on the Atlantic coast of Morocco. It has very different vibe to the more popular touristic towns of Marrakesh & Agadir. Sadly last year, EasyJet stopped its direct flights to Essaouira from London Luton. Pictured below is the last flight we took from Essaouira. ***UPDATE*** From October 2019, RyanAir will commence direct flights to Essaouira from London Stansted. But if that’s not ideal for you, then I share some other ways you can reach Essaouira. Here are 3 alternative ways to get to Enchanting Essaouira. 1. Fly into Marrakesh & Take a Coach. The very first time we visited Essaouira, this is exactly what we did. We flew into Marrakesh with RyanAir from London Luton. Booked one night at the Ibis Musaffir hotel, which is next door to the Supratours coach station. In the morning, we bought our tickets & headed off to Essaouira. The coaches were comfy and air conditioned. There is a stop part way on the 2 hour 45 minutes journey. The rest stop has clean toilets, a small cafe & an artisanal souvenir shop. Marrakech Tickets offers a service to advance purchase your coach tickets for a fee, delivering them to you at your hotel or Riad. They also support a good cause too. 2. Fly into Agadir (or Marrakesh) & Take a Private Transfer. This is the most convenient option for families with young children or larger groups. Last October Half Term, we did a two day stop in Marrakesh & then stayed 5 nights at the gorgeous Villa Kahina. Where had breakfast made for us and served outside, with our own private pool view. Perfect. Later this year we’ll be taking the new AirArabia flight from Birmingham to Agadir. 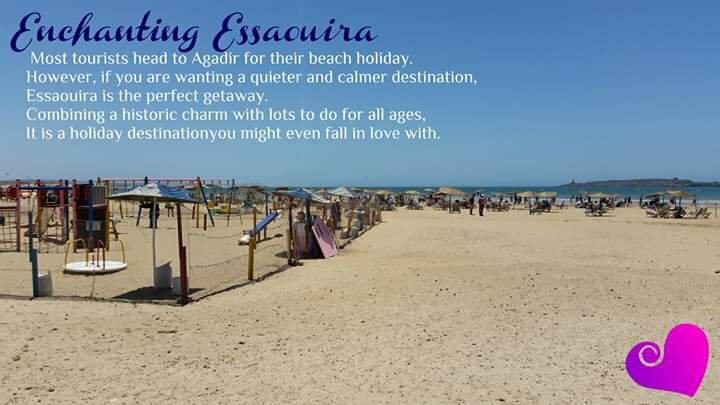 From there we will head to Essaouira, with a couple of nights stay in Agadir before we head back. 3. Fly from a European City. There are 2 cities in Europe that have Direct routes to Essaouira. EasyJet fly from Bordeaux in France to Essaouira & RyanAir will be launching it’s new route, Brussels to Essaouira. Why not fly out to Bordeaux or Brussels, spend a couple of nights in these European cities. Then catch the flight on to Essaouira. Make memories on two continents in one trip. Whenever we’re in Essaouira, there’s always a movie being filmed. Last year, Keanu Reeves & Halle Berrry were in town filming for John wick 3. There was some serious movie magic in the air! For more great practical travel advice & holiday inspiration, do follow Vacations Maroc on Facebook. Previous What is a Riad ? Are they Family-Friendly? Next Our First Airbnb Apartment stay in Agadir.